We have been having so much fun with animal books from Candlewick Press lately. We looked at insects, emus and hippos, Australian animals, bears and endangered animals and kangaroos. Today we are sharing two more animal books. 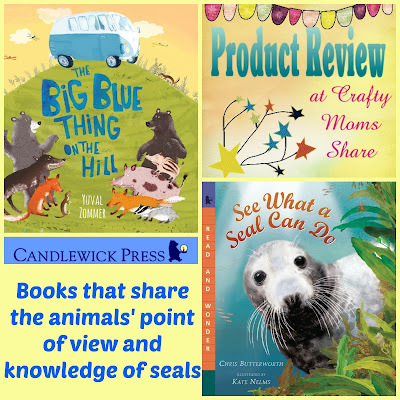 The first is a fun book with many animals who are trying to figure out what the big blue thing on the hill is and how to get rid of it and the second is about seals. 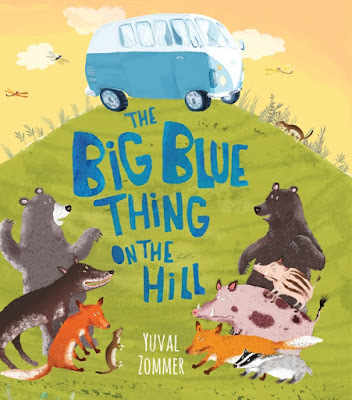 The Big Blue Thing on the Hill by Yuval Zommer is a fun book about the animals perspective. Howling Hill is far away from cities and is in the middle of the great forest. It becomes rather alive and loud at night when the wolves practice their howling and many of the animals wake up. One night the animals hear a horrible rumble and roar and find a strange new thing atop of Howling Hill. They are not sure what it is. They decide to hide and hope it goes away, but it doesn't. The next morning they hear sounds from the big blue thing and investigate some more. They are shore it is awake now, but it does not seem to be going away. The animals take turns trying to make it go away. The wolves howl at it, the bears growl at it, the boars try to nudge it,the foxes, badgers and weasels try to bury it,and when none of this works, they go ask the owl what to do. The owl suggests sending the bugs after it and a snake or two. I will leave it there so there can be a surprise for the ending. It is a fun book with fun pictures. What I enjoyed the most is that it makes the reader wonder what do the animals think about humans and their machines. It also lends itself to teaching about perspective and point of view. I imagine the big blue thing was some people trying to camp out in nature and take a break from their busy lives. The animals however see it very differently. It is invading their space and it is big and scary. It is awake during the day and sleeps at night which is opposite of them. So many fun twists on the point of view. I really enjoyed this book and Hazel did too! I had big plans to make a big blue thing/camper out of a shoe box, but it never quite happened. 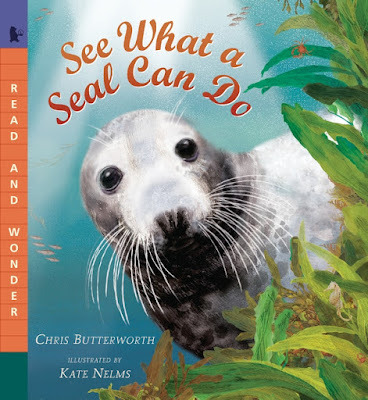 Our second book today is See What a Seal Can Do by Chris Butterworth and illustrated by Kate Nelms. I went through a stage around middle school of loving seals (and unicorns). I remember going on a long walk in Provincetown during my February school vacation with my father and grandmother to see seals. It was run by the National Seashore. We saw hundreds of seals in the water and thus made the cold long walk worthwhile for me. So I have to admit I was pretty excited to get this book to review. And of course my little animal lover enjoyed it as well. In a similar fashion to many of Candlewick's animal books, the story follows a singe seal but has little asides with facts about seals. 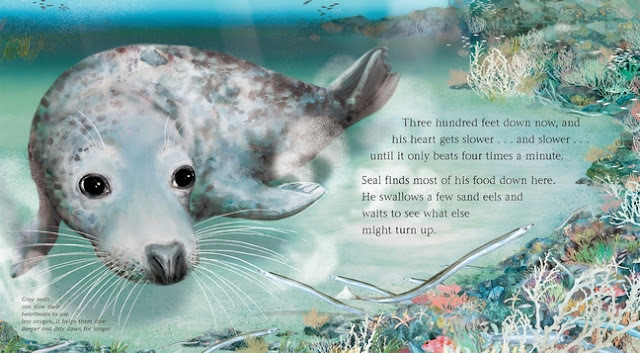 It is fun to read about the seals and to think about the seals one may see basking in the sun and thinking it must be nice to have time to just rest like that, but this book shows what the seal did to need that rest. It is an informative and fun book. 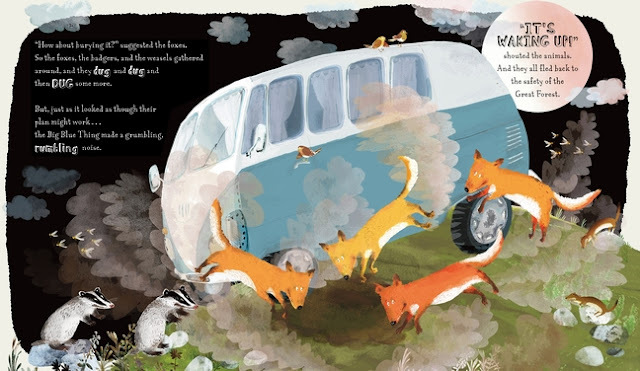 We love these animal stories!! 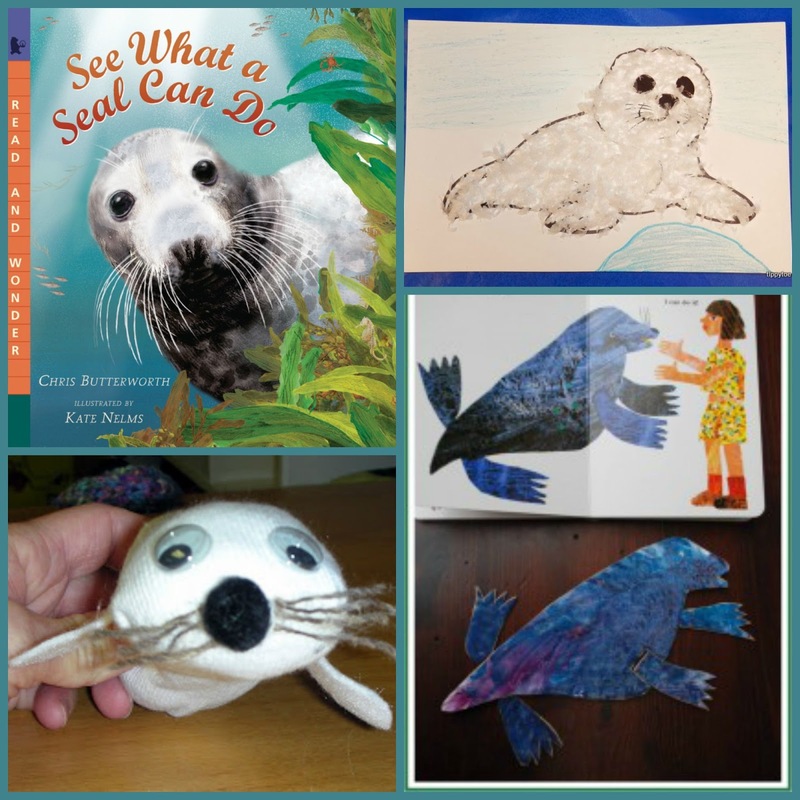 For some seal crafts to go with this book I asked some fellow bloggers to share theirs. To go with this book I found some fun seal crafts to try. From Tippytoe Crafts: Fluffy Seal Pups and Harp Seal Pups and from Red Ted Art: Kids Get Crafty Eric Carle & Homemade Puzzles.